Banfield was a running back as well as defensive back in college and gained 1183 yards from scrimmage over three seasons and scored 15 touchdowns. 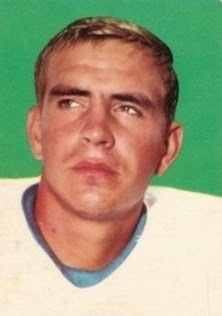 Undrafted in 1960, he signed with the Oilers of the new AFL, who originally tried him in the offensive backfield before shifting him to cornerback. He showed promise as a rookie, intercepting three passes although hindered by ankle and leg injuries. While lacking ideal speed, he proved to be adept as a ball hawk and at breaking up passes. Oilers went 10-3-1 to finish first in the AFL Eastern Division. Won AFL Championship over San Diego Chargers (10-3). Banfield followed up by being a consensus first-team All-AFL selection in each of the next two seasons, although a knee injury limited his use during the second half of the 1963 season and he split time with Mark Johnston. He missed the entire ’64 season while rehabbing from the injury and, while he returned, he was a lesser performer in 1965, his last season. In an outstanding, if injury-shortened, career with the Oilers, Banfield intercepted 27 passes and received first-team All-AFL honors three times.